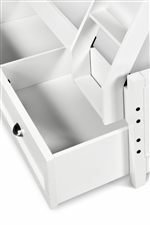 Featuring a nifty built-in bookcase and storage rails with a total of three underbed storage drawers, this bed offers understated style and convenience for the youth bedroom. The open shelves on the captain-style bed can be used to house your son or daughter's favorite bedtime reads or an alarm clock and picture frame, eliminating the need for a nightstand and saving valuable space. A built-in nightlight is featured at the headboard as well, so there's no need for a lamp. 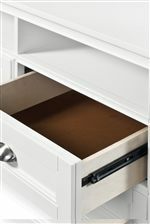 With three underbed storage drawers, your child will have plenty of room for clothing, toys and personal belongings. This bed is available in twin and full sizes. The Beck White Full Lounge Bed with Bookcase and Underbed Storage by Next Generation by Magnussen at Reeds Furniture in the Los Angeles, Thousand Oaks, Simi Valley, Agoura Hills, Woodland Hills, California area. Product availability may vary. Contact us for the most current availability on this product. Y1875-59B Twin/Full Lounge Bed Bookcase Back Panel 1 83" 10" 50"
Y1875-69P Full Lounge Bed Side Panels & Slat Roll 1 55" 14" 2"
Y1875-59S Twin/Full Lounge Bed Drawer Box with Storage 1 80" 18" 18"
When it comes to dressing up a room, nothing sets the stage like the Kenley youth bedroom collection. 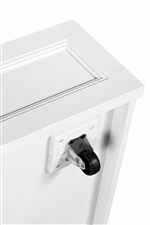 With recessed paneling, a painted white finish and nickel drawer pulls, the collection offers clean-cut style with abundant functionality. The dresser mirror with cork panels provides your youth a spot for photographs and notes, while the nightstand with a built-in charging station, touch lighting and night light allows for bedside charging of handheld devices and accessible storage. 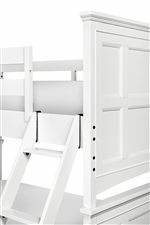 Select from bunks and bookcase storage beds, available in twin and full sizes. The Beck White collection is a great option if you are looking for Casual furniture in the Los Angeles, Thousand Oaks, Simi Valley, Agoura Hills, Woodland Hills, California area. 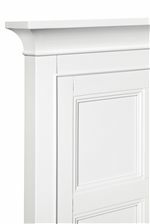 Browse other items in the Beck White collection from Reeds Furniture in the Los Angeles, Thousand Oaks, Simi Valley, Agoura Hills, Woodland Hills, California area.